Heads'ls Nos. 1, 2 and 3 staysails. 2 and 3 are Egyptian cotton,Cranfieldand Carter, dated 1951, still in good condition. Other comments: 'Virtue' was built to be shown at the Festival of Britain, 1951, as an example of British craftmanship. She was then called 'Festival Virtue.' 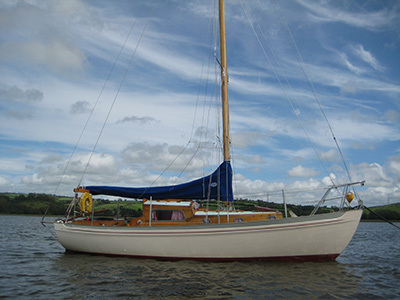 sold to Captain Glanfield, she reamained in his family until sold to me some 9 years ago, so I am only her second owner. 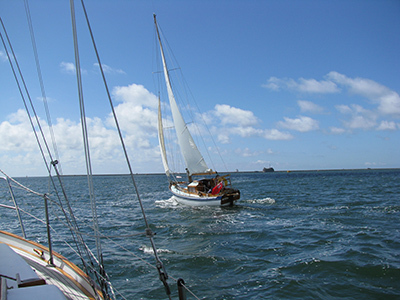 Until coming down to the West Country, she sailed out of Brightlingsea. 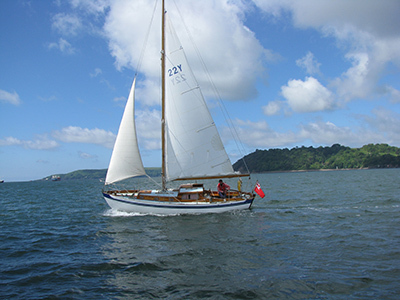 She is in good condition, can be sailed hard without needing pumping and is all you expect from a Vertue. I renewed most of the keel bolts 4 years ago, a fairly straightforward job, then renewed all the chainplates 2 winters ago, which was a brute. As the new plates are stainless steel, I shall never need to do the job again. Stebbingsarchive.net has a section on her, including three excellent photographs of her as new. I have a number of photographs taken in the last few years and will be happy to forward them to you. The old Vertue website had several pictures on it, but these are probably now lost.